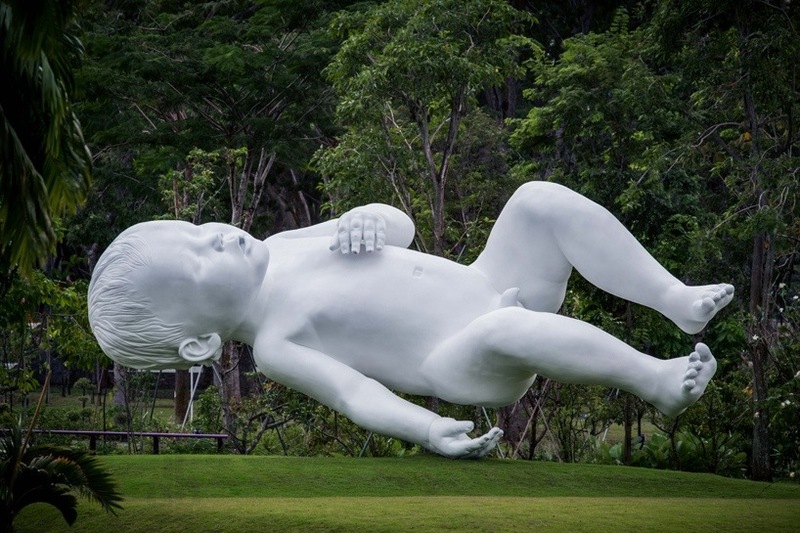 Image courtesy Marc Quinn and Singapore’s Garden by the Bay. The artist Marc Quinn, known famously for his bust sculpture titled “blood head self portraits” created over a five year period of the artist’s head made entirely from his blood, has another project equally as personal heading it’s way to Singapore. These sculptures were also shown in 2008 for show at the Chatsworth House in the UK and at Musée Océanographique in Monaco in 2012. The work is comprised of three giant sculptures of his son which each weigh seven tons and are each 10 meters in length (33 feet). They are titled “planet”, “innoscience” and “lucas”. Playing with scale like this has a long history in art. Specifically with the human figure. 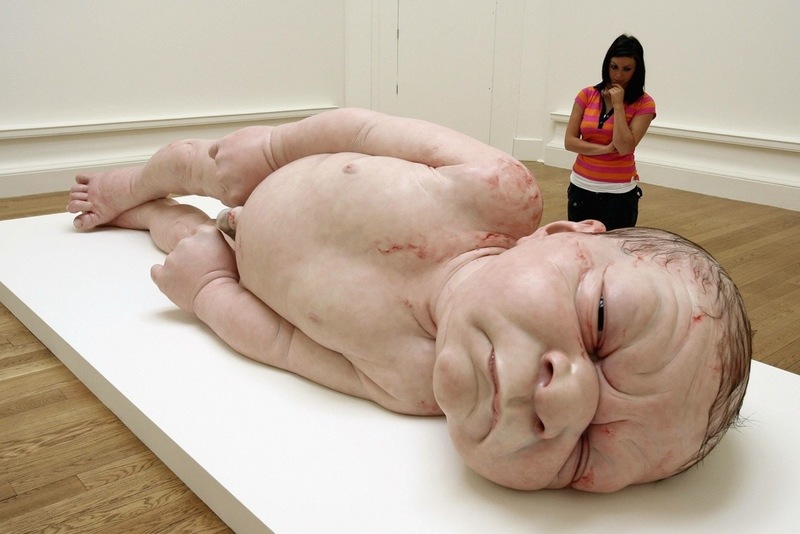 With respect to wonky-sized babies, a couple of other contemporary artists come to mind. Ron Mueck makes hyperrealist sculpture of humans always off scale – either uncomfortably small, or invasively large. In terms of awe inspiring his sculpture of “A Girl” comes to mind. Like Quinn’s it is a gargantuan baby – though at the moment of birth. Quinn’s sculpture is clean and white, and has always been on display out doors, where you have the entire sky to escape with your anxieties about seeing an infant tower over you. Mueck’s work confronts you in the claustrophobic context of a gallery where you are forced to come to terms with the bloody, vulnerable image in front of you. While both are shocking, Quinn’s seems much more like a giant homage to his son, in quintessential pop style. The deepest layer of investigation I have when looking at it is only technical and superficial “how on earth did they transport this here?”, “how pretty the white is”. Versus the Mueck work, in its incredible realism your emotions get pushed all over the place, “what will happen if I leave the room”, “who is helping this baby”- basically it flips a switch in your imagination and you begin to create a story around the work – what all great art does I believe. Lastly, some giant babies I have adored in all of their wicked wonder are Marlene Dumas “First People”. This is a triptych of humongous infants, painted in not the most charming light – they mostly illicit discomfort. She painted the babies before having her own daughter, and as is the case generally before you learn about children first hand the concept is generally terrifying. Lack of information breeds fear. I’ve explored the theme of children as oversized and overpowering in my work too – it’s actually a reoccuring theme. Young children are actually brilliant – they have more smarts than we will ever have – we lose most our intuition as we grow older and socialized. Some of us try constantly to build that skill back up. Children have incredible intuitive power – they can smell anxiety and discomfort in a caregiver in a heartbeat, and speak incredible truth. So while the size of the sculptures is way off the mark, the sentiment in their work whether admiration for your children, terror of parenting, or the sheer anxiety of the responsibilty of parenting is spot on. Mueck’s sculpture should be required viewing for teenagers and aspiring parents.